As your own years pass you may find that you have outgrow your hometown and want or need to move on. This was the situation I found myself in having outgrown life in my hometown of Orillia, knowing that it was time to branch out and explore. I was at an age that I needed to prove myself as my own person. Here are a few stories from my Canuck – an endearing term – teenage years, local travels, some overseas backpacking and having my own family to eventually leave Canada for a new adventure in Australia. It’s not too personal a tale, nothing juicy or revealing but a snapshot of the highlights of life as it was for me. Recalling the fun times and the new things discovered in developing this website is like living all over again or reminiscing. Its only through travel, adventure and meeting new people does one expand their horizons and a better understanding of life, in my humble view. Once struck by the travel bug, it is hard to resist and probably the reason I became a wanderer of sorts. I learned the joy of traveling from an early age and fondly recall many trips that widened my perspective and outlook on life, the world, and people. This was a high school graduation escape for Jim and I, two teenagers who were getting out of small town Orillia to check out the big wide world. Our cross country travel route and camper van? We convinced our parents of our responsible natures and wise approach to life; we convinced them that using the truck from our family business would be fine and the right thing to do as a graduation gift. The months of planning and working out routes and attractions to see kept us busy. We constructed a cabin for the back of the pick-up truck to provide us a place to sleep and we stocked up on camping equipment and supplies. This trip was going to have to be done as cheaply as possible so camping and cooking our way across Canada and back through the northern part of the USA was planned. Jim sorting out our camping arrangements? 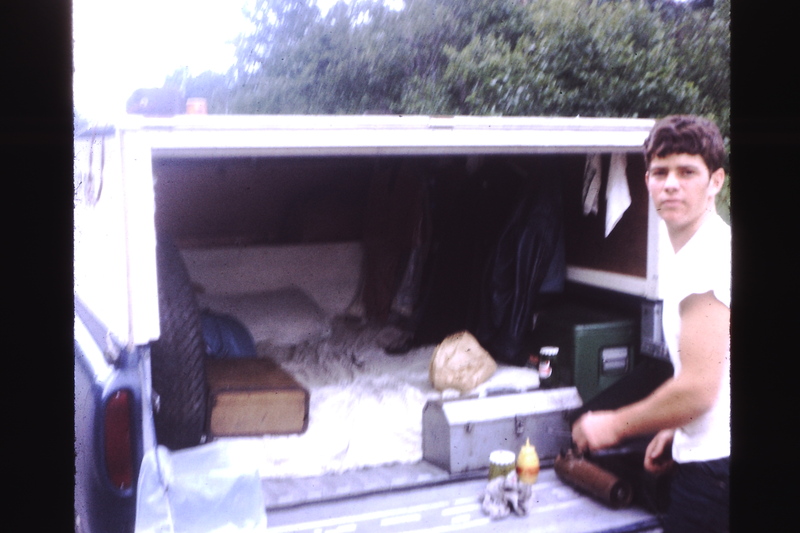 It was a summer trip in 1968 – i think – after leaving school having finished year 12. My application for the RCMP had been lodged and was being processed so while waiting it seemed the best time to take on the world and discover Canada and the US on our own. 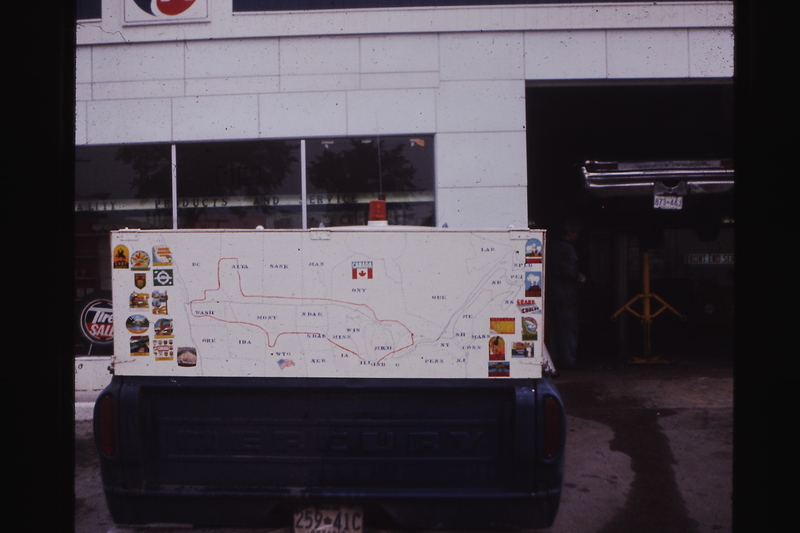 The trip was planned to head west through southern Canada and return via the northern USA. The memory has gone a bit fuzzy but the trip was about 2 months long leaving late June and returning in August, as I recall, and it was an adventure for us both. I struggled to find pictures of this adventure but did find some old slides that I have digitally uploaded – so they are not the best but the only ones I have. It was fun trying to piece this journey together again. The road trip leaving Ontario, headed through Manitoba and into Saskatchewan. It was a long wilderness drive through the north of Ontario, stopping at the famous Canada goose monument and then flat prairie greeted us. We hit Winnipeg and Regina the home of RCMP training that I would return to in February 69. We would stop and camp at national parks, private camp grounds or on the roadside depending on where we ended up and how tired we were. We used a camp cooking stove for most of our meals – I think we shared the cooking duties. Next, we entered Alberta and stopped in to visit my uncle in Didsbury on his cattle ranch. A visit to Dinosaur National Park and the Tar Sands were also an education. We headed up through Banff and Jasper National Parks, checking out the Banff springs hotel, the glacier national park, and soaked up the vistas of the mountains. We enjoyed some great camping in the beautiful mountain parks and then over the Rogers Pass in the Rockies and through to British Columbia. I think our cooking was pretty basic with beans, toast, eggs and some meat from time to time. We had to be thrifty with the dollars as it had to pay for gas, food, some beer and camping permits. We took a trip to Vancouver Island as I recall before heading south to the US. Our return journey would be taken through the norther US states of Washington, Montana, Wyoming, South Dakota, Colorado, Iowa, Wisconsin and back through Niagara Falls to Orillia. We saw new sites, were impressed with the distance we traveled, enjoyed great new experiences with people, wildlife and vistas encountered. There are separate pages covering my exciting policing career at different postings. After my first 4 years of Policing, I decided on a long holiday that turned out to be a year-long break from the RCMP. I couldn’t get extended leave so I resigned to travel backpack style through Europe, North Africa and England. After just over a year off I rejoined the RCMP but you can find out all about that by checking the menu and heading to the RCMP pages. It was a dream to belong to the RCMP and serve my country policing. The dream probably had left out the fact that my early years were spent on Indian reservations and in hotel bar rooms either arresting, fighting or trying to break up fights much of the time. It seemed that for about 4 years that was what I was doing much of my duty time and I got sick of it. You just didn’t have much dealing with normal everyday people and all this eventually culminated in me wanting to take a long European holiday. The Force said no, you can only go on your normal leave and my travel plans were much longer. So decision made – I resigned to get a long holiday – but will return to rejoin and serve. It was off to Europe from Toronto with only a backpack of clothes, sleeping bag and some essentials. My arrival destination was Madrid, Spain. 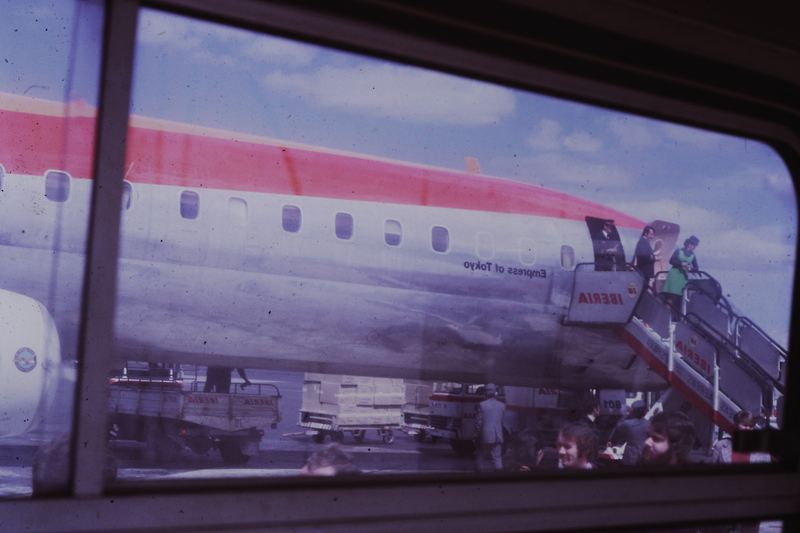 I seem to have only a few photo’s that I can find from this journey of nearly 12 months – they were slides and I have done my best to capture them digitally to help tell this story. There were more but must have been lost or misplaced from all the moving around over the years. I am grateful for these few. Having arrived in Madrid I remember getting a bus into the city and looking around on the side streets of the main square for a pension – a room and after being shown a few and sorting out the costs I found a place to rest my head. Here I was a world away from what I had been doing in a strange country and I didn’t speak the language this was going to be challenging. Travelling alone had its advantages and disadvantages but I was self-reliant and enjoyed doing things on my own – at times. I got out every day and explored the city, the cathedrals and the ancient architecture – it was all so different. After awhile I decided to check out youth hostels as these provided an opportunity to meet other travelers and to get tips and tricks on where to go, things to look out for and perhaps even a travel companion from time to time. This proved successful, it provided cheap accommodation and usually allowed for going out with a group to see things, pubs and to eat. I eventually decided it was time to move on and Portugal was the next call as I heard it was nice. A bus trip to Lisbon was organised and upon my arrival, I meet up with university students in the city square who wanted to practice English. I was in the city square having a drink and something to eat when I heard some people calling out to me and I was asked to join this group. They invited me to holiday with them when they went on break in a month, so I decided to travel around Portugal while I waited for this opportunity. I made my way down the coast of Portugal hitchhiking and camping out until I reached the Sagres and the 15th century fortress that was also a youth hostel in those days. I recall the efforts to get food and pointing to items on plates or going into kitchens and pointing to something to eat. The people were friendly and helpful. I generally was lucky with rides and didn’t usually have to wait long to get a ride along the road to wherever the driver was going. There were some interesting people and generally glad to help – a few were seeking favors for rides which I kindly declined. I remember the small towns and villages with chickens in the streets. Camping off the road at night, hidden from view of passers by, for safety. It was a time of daring and challenge – it was a time where hitchhiking was still fashionable.